Whether you looking to launch a new brand or a new product, or you want to run a special promotion, there are lots of things to consider. Planning your product launch is vital. In fact, what goes into the pre-launch and post-launch will go a long way in determining how successful you are. But central to any product launch or promotion is the main event itself. Even if the launch is for something digital, such as a new website, the trick is to turn it into an event and, if your product launch or promotion requires an actual, physical event, there is one sure-fire way of making sure your event is a memorable one: hire live music entertainment. And that’s where Silk Street Jazz come in! Product launch or promotion: What can Silk Street Jazz do? Anytime, anywhere, anyhow – wherever your product launch or promotion might be – you need to grab people’s attention. Whatever the occasion, Silk Street Jazz are guaranteed to get everyone’s foot tapping. The silky jazz sounds of a 3 piece of 4 piece line-up will definitely draw in the crowds with their music. Once described as “the best New Orleans band outside of New Orleans” Silk Street Jazz can bring a little touch of Louisiana to any location. When we say ‘any location’ we really do mean any! As a fully acoustic act, Silk Street Jazz can perform literally anywhere. From shop-fronts to balconies or stairways, escalators, in-store, or on a double decker bus. We really do mean anywhere. With us it is a case of ‘Have trumpet, will travel’. We will set up anywhere you want to entertain your guests and pull in the passers by. Just think a shopping centre in Margate, Middlesbrough or Milton Keynes can suddenly have its own Mardi Gras! 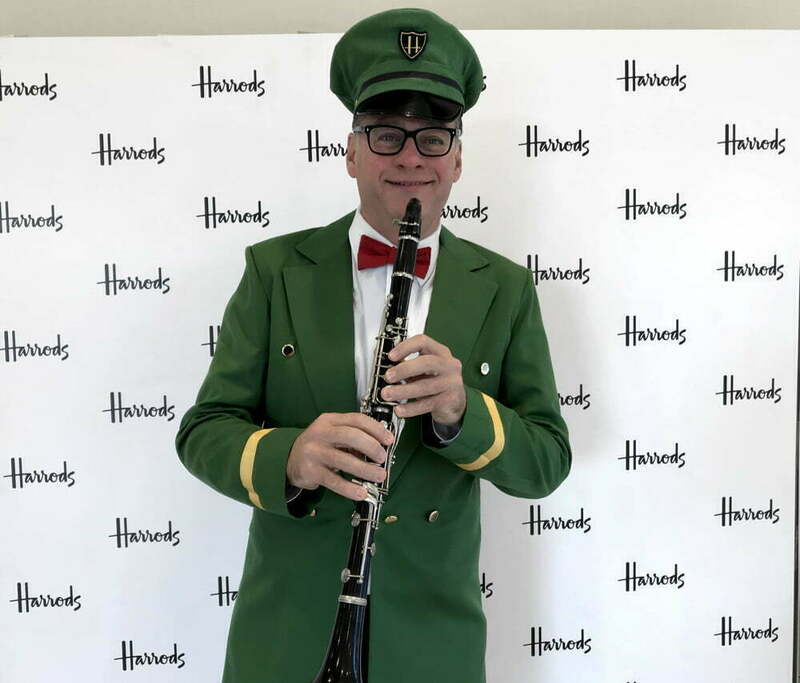 Another thing you can be sure of when you hire Silk Street Jazz for your product launch or promotion is that we will get right into the swing of things. If you want us to reflect your corporate colours in our attire, we can. If you want us to giveaway freebies or product samples, we can. We perform, we promote and we produce great advertising for your product or service. Let’s take a look at some of the past events that Silk Street Jazz have performed at. It will give you a flavour of what we can bring to a promotion or product launch. 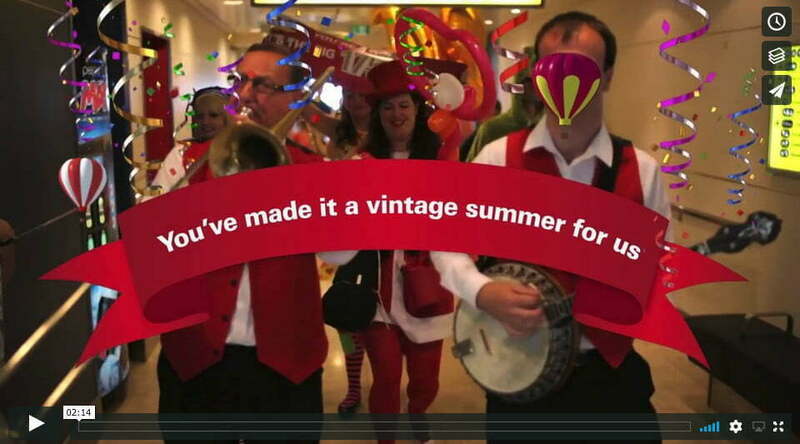 Check out our performance for the McVitie’s Bring Out The Cake promotion. Notice how we have substituted our normal red and white attire for McVitie’s blue and yellow. 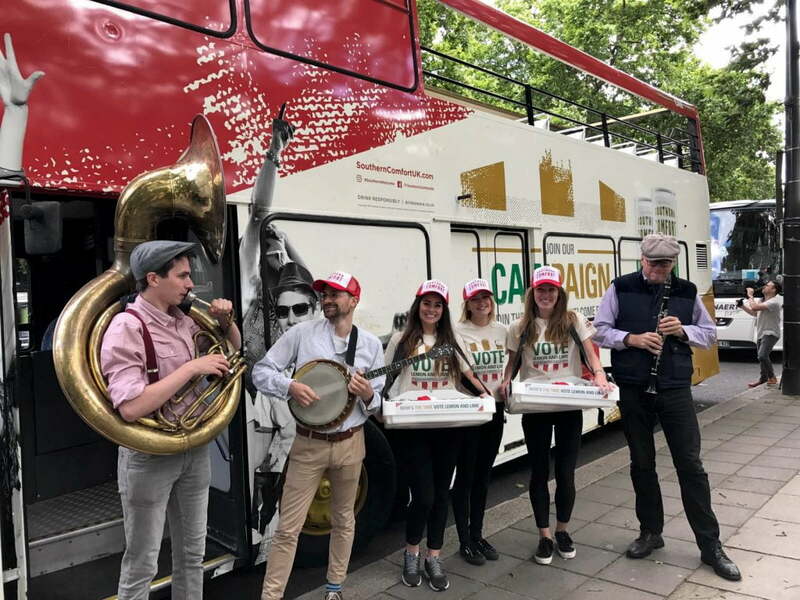 The brief was to provide the musical accompaniment as cakes McVitie’s cakes are offered to (slightly bemused) members of the public. There’s a real sense of fun that clearly comes out of this promotion. A little bit of jazz goes a long way, you see. #2 Internet Viral Advert: Barclaycard PayTag advert with The Hoff! One of our favourite engagements ever was when we had the pleasure of meeting the absolute legend that is The Hoff. Say no more! But maybe we should explain… Silk Street Jazz provide the soundtrack to the ad which tells the story of what happens to the first customer to use his Barclaycard Pay Tag. Instantly, scenes of celebration begin: a town crier, cheerleaders, dancers of all types and the upbeat party jazz sounds of the band. Then, of course, comes the icing on the cake – the appearance of The Hoff himself! Fair’s fair, jazz music might not appear to be the most obvious bedfellow for credit cards, biscuit/cake manufacturers, or ferry companies. However, we have hopefully shown in this blog that Silk Street Jazz can be the perfect match for any product or promotion. But sometimes, we come across a match made in heaven – an inspired combination – and this was definitely the case when we teamed up this summer with creative agency We Are Kemosabe and Southern Comfort on their #SouthernWelcome Canpaign Tour. New Orleans jazz and Southern Comfort made for an irresistible blend of the Deep South. And to prove the point that Silk Street Jazz will happily perform anywhere, take a look at us riding the ocean waves celebrating P&O Ferries anniversary Watch the P&O Ferries Promotional Anniversary Video from Silk Street on Vimeo. As you will see, as a thank you to their customers who had made it a vintage summer, P&O marked their 175th birthday by handing out birthday surprise gifts to the passengers on board ‘The Spirit of Britain’. Gifts ranged from an iPod Touch to free return travel and presents for the kids. Silk Street Jazz matched the brief perfectly with our vintage, good time celebratory sounds. For a UK wide Volkswagen Car Promotion Silk Street Jazz performed upbeat music to draw families in to take a look at the new Touran and Toureg models. Email addresses were then captured for marketing purposes. 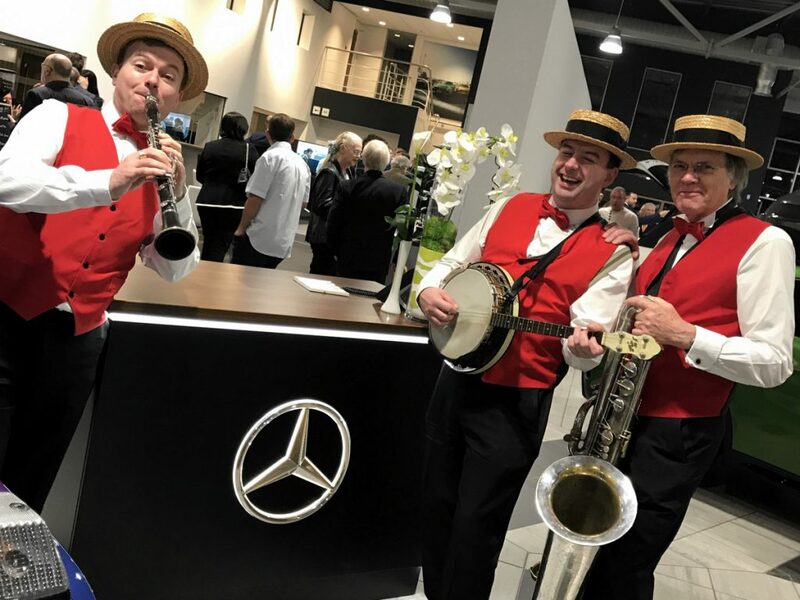 Another event was a Mercedes Benz Open Evening in Sheffield. This was to promote the opening of a new garage and a VIP evening for invited guests. Both events required a real touch of class and style, but with a little bit of cheekiness thrown in for good measure – right up our (Silk) Street! The message is clear. If you have a product to launch or promote, it needs to be a real event. If you want to create an event, you need first class entertainment. Silk Street Jazz are an act you can trust to perform at your event with supreme professionalism and a healthy splash of pizzazz. Get in touch today to chat to us about how we can help promote your next product or five your brand a boost.